The lesses popular part of the city centre but worth seeing anyway! Passing from the narrow cobblestone streets of Warsaw's picturesque Old Town through the fairytale-like Barbican structure, you come upon what is called the New Town - a late-14th century settlement that for centuries existed as a separate city outside Warsaw's defensive walls. 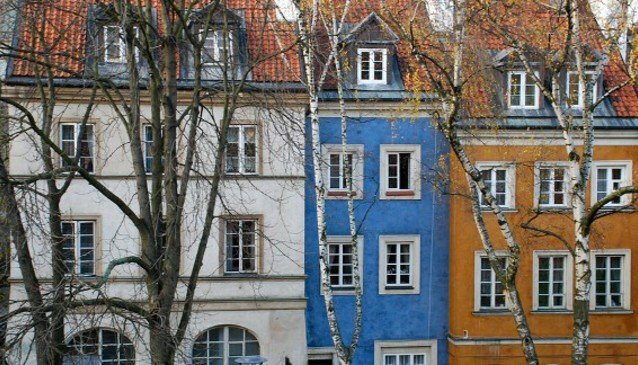 Slightly less compact than the Old Town, the handful of quaint little streets offers plenty of opportunities for an open-air meal or drink in the shadow of some magnificent baroque and neoclassical architecture. The New Town's main street, Freta, runs from the Barbican and up past the New Town Square. Originally made of timber, the buildings along this thoroughfare were almost completely destroyed during the 17th-century Swedish invasion, called the Deluge in Polish history. Most buildings were reconstructed in the Palladian style, which is what you can see today. The New Town Square is long, open and sprawling, with a wide sidewalk border and tree-shaded benches. You can catch a pleasant view from an outdoor café along Freta Street or around the perimeter of the square, less crowded than in the Old Town. Laid out sometime in the 15th century, the New Town Square was once about twice the size it is today, with its own Town Hall in the centre; where the Town Hall once stood you can now see a well, decorated with the New Town's coat of arms - a Virgin and a Unicorn. There are no fewer than six historic churches clustered in the New Town, and some are well worth dropping into. The Church of the Holy Spirit, with its symmetrical white towers and white neoclassical façade, was built in 1717, originally as a hospital chapel. 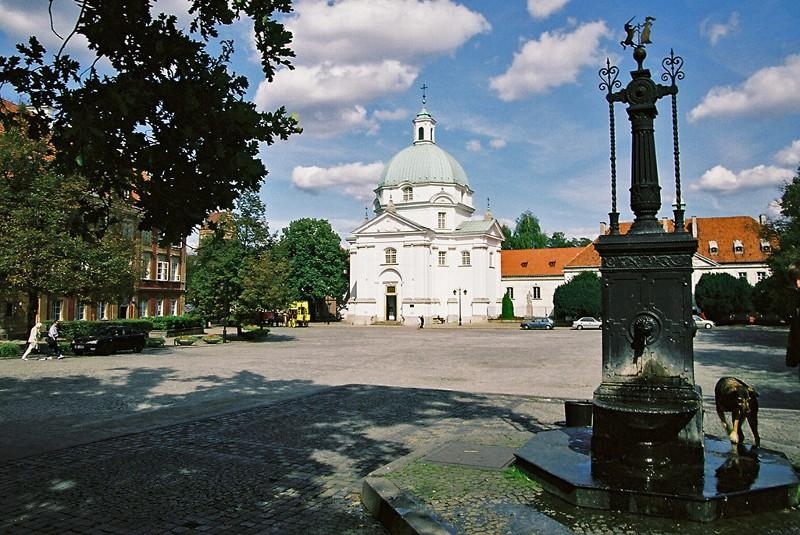 It is the starting point for yearly pilgrimages to Czestochowa. Opposite along Freta Street is Saint Jacek's Church, which housed the insurgent's hospital during the Warsaw Uprising, and displays a mixture of Renaissance and Baroque style. The Church of Saint Kazimierz, standing at the far end of the New Town Square, has a colourful history. The pale rotunda mounted over a modest white baroque structure is what remains of the great Kotowski Palace, bought by Queen Maria Kazimierza Sobieska and turned into a church in the 17th century as a sign of thanksgiving for her husband's victory over the Turks in Vienna. During the Warsaw Uprising, the church was used as a hospital and civilian refuge, and over a thousand civilians were killed here in a single raid. Its stark white interior with simple wooden pews contains an original 18th century pulpit, organ and bells, and the tombs of some significant nobles. If you look at old sketches and paintings of Warsaw's Renaissance skyline, you'll notice the distinctive outline of a bell tower in the New Town, added in 1518 to the earlier Gothic Church of the Visitation of the Blessed Virgin Mary. 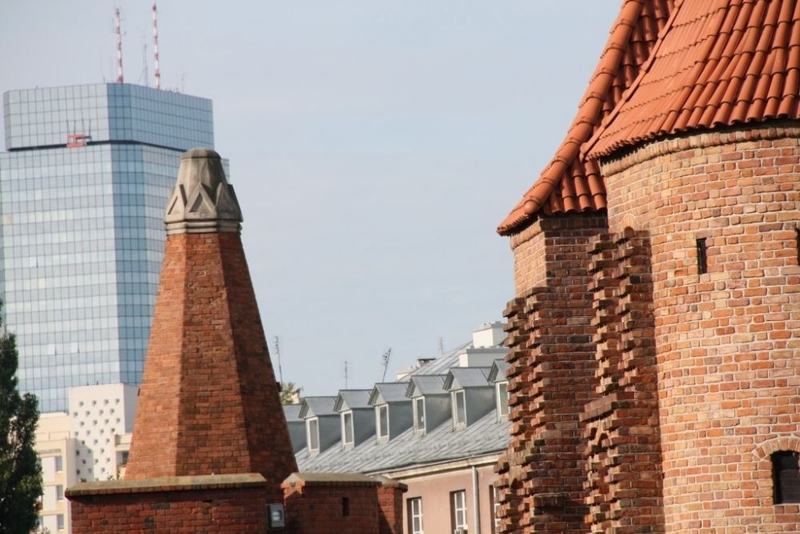 The church, a red brick structure with the crumbling charm of long ages, is one of the oldest buildings in Warsaw, and easily spotted from the other side of the river, a characteristic outline in Warsaw's silhouette. During the Warsaw Uprising, German bombings were directed from this strategic point, ultimately saving the church from destruction, and making it one of the city's few original historic buildings. It stands on the site of a former pagan temple, known as the 'temple of fishermen', so this has clearly been a holy site since long before Poland came to exist. The church stands just off the New Town Square, with a beautiful panoramic view of Praga from its back terrace. Farther up Freta Street you'll come upon the Maria Sklodowska-Curie Museum, housed in the 18th-century townhouse where she was born. Drop in for a look at some of this famous Nobel Prize winner's authentic scientific tools and personal objects, as well as pictures of her and her friends, documents, coins and medals, 19th-century furniture, lab instruments of the era, and biographical films. The New Town also has its share of palaces, built by great noble families as the city expanded beyond its defensive walls. Worth noting are the Sapieha Palace on Zakroczymska Street, built for the Lithuanian Chancellor in the early 18th century, a creamy pink neoclassical structure under a frenzy of sculptured urns and flags, which was used as a barracks during the 1830 November Uprising and now houses a school; and the Raczynski Palace, on Dluga Street, once home to a famous crown traitor, later becoming the seat of the Supreme National Council during the tense pre-partition years, a barracks for Napoleon's officers, the Ministry of Justice, the German Court for Occupied Territories during the Second World War, and finally a hospital during the Warsaw Uprising. After the capitulation of the Old Town on 1 September 1944, the Germans shot about 430 of the hospital patients, for whom a plaque now hangs on the outer wall. Leading out from the New Town, Dluga Street (Long Street) is one of the oldest streets in Warsaw and as such is itself something of a monument. In the Middle Ages, it was the route leading to Sochaczew and Lowicz. It is uncommonly wide for a city street, as it also once served as a marketplace. After a stroll around the New Town, some photographs of Praga's panorama, a peek into some of the historic churches and a drink on the New Town Square, head down Dluga Street toward the historic Krasinski Square, beautiful Krasinski Palace and breathtaking Monument of the Warsaw Uprising.